As I mentioned in previous post about changes in GATE 2014 but was not certain because of time limit and other factors. But a tender notice from IIT Kharagpur reading as follows cleared much of the doubts. Yes get ready to see the change in GATE 2014. The tender reads as follows. For updates follow GATE 2014 changes video. Just to share with you this will have a great effect on whole M.Tech admissions but on the same time make a clear difference between student writing GATE exam for PSU jobs and who are looking for M.Tech admissions. Other private sector companies might also think about considering GATE as intake test. This will totally increase the number of student taking GATE. As I mentioned in my previous post, if you are looking for GATE this year start preparing with Maths and Aptitude. More updates on this and GATE preparation will be given time to time. I ask you like InI on facebook, follow us on G+ and subscribe for more updates. ???? what is the outcome.. will there be difficult questions ??? can we edit the answer once chosen in GATE 14 exam? and can we re-access the previous questions once seen? please clarify…. As per the given latest communication from Zahid, Its clear now that this is the last chance to get easy with Gate. 1. 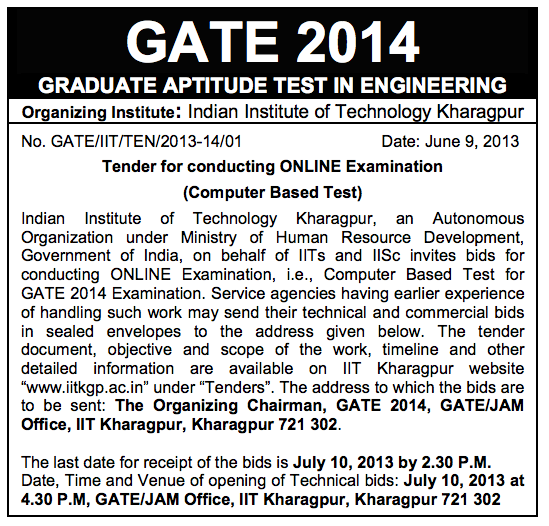 GATE 2014 is being organized by IIT Kharagpur. 2. The examinations for all the papers will be conducted in computer based Online Examination mode in multiple sessions spread over the period from 1st February 2014 to 9th March 2014. 3. The Online Examination is proposed to be conducted in 12 sessions on 6 days (1st, 2nd, 15th, 16th February, 2014 and 1st and 2nd March 2014) with extra buffer sessions, if needed. 5. There’ll be only one paper per branch. No two-tier exam. 6. The structure for all papers in GATE 2014 will be similar to the papers for which the examination was conducted in ONLINE mode in GATE 2013. 9. Mock tests will be conducted during 25th to 29th of January 2014 using old question papers loaded on the respective zonal websites of GATE 2014. *	Keyboard should be disabled. *	Use of a virtual keypad. *	The candidate cannot exit the exam at any point of time during the entire duration of the test. Official notification for GATE 2014 will be out sometime in the mid of September 2013. But, as of now, we can interpret some conclusions. Take some time to realize that there is nothing to worry about these changes and I would rather say the changes are for the good. 1. The duration of GATE examination and the paper format remains almost the same as of previous years. 2. The numerical answer questions will summarily wipe out candidates who tend to have less knowledge, but fluke more and get lucky. 3. No more filling up bubbles with pen, thereby saving a lot of precious time during the examination. This is same for everybody, but I would put it this way: Nobody gets screwed due to bubble filling mistakes, so you also don’t get screwd! 4. A computer-based examination spread over multiple sessions (at least for branches with huge no. of candidates like CS, EC, etc.) cannot be difficult or very difficult since it will impose enormous complexity during normalization of the test scores from different days. So, GATE 2014 is expected to be either easy or of average difficulty level, and therefore you can expect some pretty high scores in GATE 2014 by those who answer numerical answer type questions carefully. Solve a lot of numericals. all i got from the tender notice is that every paper will be online. there is no hint of two tier or multiple sessions for a single user. and hell yeah PSUs will consider gate 2014 score. any mechanical buddy ambitious.. and seriously preparing GATE2014 and looking for a partner in sharing material and solving some mind freaking problems.. please do message me at [email protected].. i could really use a partner. come on guyss.. we still have 7 months. let’s get the kick out of this tough fight. after all.. if not us.. who else will? Your wise prediction that “GATE is going to be online exam soon” seemed to be heard by the Almighty (Does He also follow InI ?). @ ZAHID: Plz recommend Aptitude and Maths book other than R S Agarwal & D R Choudhary. Hmm, Cat is Out of Bag now! Pliz have a common sense. Zahid bro is helping lakhs of students by giving each and every minute details about how to prepare, how to face gate and after gate. Above all, as the time being he motivates us & let us know the path to follow by a gate aspirant. If u dnt mind, ur post may hurt others like me who is following I&I. We should accept the hard work of zahid bro in helping & guiding so many……… so called… enginners. Expected changes in GATE 2014 – Latest information. Thank you Saurabh for going into the thick of the tender notification and extracting the cream on behalf of all INItes. Your previous post came as a relief for a lot of followers. I believe that the GATE committee has scrutinized the grand scope of a 2-phase exam and decided to proceed one step at a time. http://iitkgp.ac.in/tenders/gate_online.pdf . jst go through this pDF . Date is also mentioned here and all the paper’s will be online . so chances of prelims and mains still exist. may be in prelims we will get the score immediately after completion of test.. then they’ll release some cut off score in like two days.. and based on that cut off.. qualified students will attend mains..! this is what i guess..
1)The Prelim or the 1st stage will consist of only Maths & aptitude or there might be provision for technical subject? 2)Please Provide Information for details about the approximate time duration for gate official Announcement. can it be a tender notification for those gate papers for which online exam is always conducted.? As clearly mentioned in full copy of tender notice there will be a computer based test based on same previous gate exam pattern. This test will be organised from on 8 dates between 1feb to 2march. So roumers about gate being conducted in to two phases should be stopped now. Only change is it being online and will be organized by an agency. Your previous post was misguidin. It was not misguiding, it was based on initial proposal from GATE strategy committee. I also mentioned that we need to wait for more updates. If you look into https://www.inspirenignite.com/changes-in-gate-2013-what-and-why-are-important/ you will understand what I was predicting for GATE 2014. It just happen that the proposal came in between because of high volume of GATE applications. Thank you soo much for inputs. Dear Zahid, I think saurabh is right.The complete analysis will lead you to the conclusion that, all papers are just going to be online. I appreciate your works. Now a lot of aspirants need your advice for the opinion regarding GATE 2014.Please reply with your analysis ASAP.